Marty is a 1955 American romantic drama film directed by Delbert Mann. The screenplay was written by Paddy Chayefsky, expanding upon his 1953 teleplay of the same name. 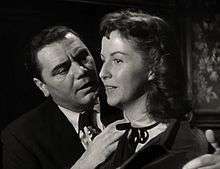 The film stars Ernest Borgnine and Betsy Blair. In addition to gaining an Academy Award for Best Picture, the film enjoyed international success, becoming the fourth American film to win top prize at the Cannes Film Festival, and by a unanimous vote, becoming the first film to be awarded the Palme d'Or. Marty and The Lost Weekend (1945) are the only two films to win both organizations' grand prizes. Marty Piletti (Ernest Borgnine) is an Italian American butcher who lives in The Bronx with his mother (Esther Minciotti). Unmarried at 34, the good-natured but socially awkward Marty faces constant badgering from family and friends to settle down, pointing out that all his brothers and sisters are already married with children. Not averse to marriage but disheartened by his lack of prospects, Marty has reluctantly resigned himself to bachelorhood. After being harassed by his mother into going to the Stardust Ballroom one Saturday night, Marty connects with Clara (Betsy Blair), a plain schoolteacher who is quietly weeping on the roof after being callously abandoned at the ballroom by her blind date. They spend the evening together dancing, walking the busy streets, and talking in a diner. Marty eagerly spills out his life story and ambitions, and they encourage each other. He brings Clara to his house, and they awkwardly express their mutual attraction, shortly before his mother returns. Marty takes her home by bus, promising to call her at 2:30 the next afternoon, after Mass. Overjoyed, he punches the bus stop sign and weaves between the cars, looking for a cab. Meanwhile, his cranky, busybody widowed Aunt Catherine (Augusta Ciolli) moves in to live with Marty and his mother. She warns his mother that Marty will soon marry and cast her aside. Fearing that Marty's romance could spell her abandonment, his mother belittles Clara. Marty's friends, with an undercurrent of envy, deride Clara for her plainness and try to convince him to forget her and to remain with them, unmarried, in their fading youth. Harangued into submission by the pull of his friends, Marty doesn't call Clara. You don't like her, my mother don't like her, she's a dog and I'm a fat, ugly man! Well, all I know is I had a good time last night! I'm gonna have a good time tonight! If we have enough good times together, I'm gonna get down on my knees and I'm gonna beg that girl to marry me! If we make a party on New Year's, I got a date for that party. You don't like her? That's too bad! Marty closes the phone booth's door when Clara answers the phone. In the last line of the film, he tentatively says "Hello... Hello, Clara?". For the film, Esther Minciotti, Augusta Ciolli and Joe Mantell reprised their roles from the live television production. The screenplay changed the name of the Waverly Ballroom to the Stardust Ballroom. The film expanded the role of Clara, and subplots about Marty's career and his mother and her sister were added. Shooting for the film began on September 7, 1954, in The Bronx, and included many aspects of the borough into the film, such as Grand Concourse, Arthur Avenue, Gun Hill Road, White Plains Road, and several Bronx subway and elevated train lines, including the Concourse, Third Avenue, White Plains Road, and Jerome Avenue lines. On-set filming took place at Samuel Goldwyn Studios on November 1, 1954. Bronx native Jerry Orbach made his film debut in an uncredited role as a ballroom guest. Chayefsky had an uncredited cameo as Leo. The role of Clara was initially going to be reprised by actress Nancy Marchand, later of Lou Grant and The Sopranos fame, who had portrayed the character in the television version. However, actress Betsy Blair was interested in playing the role and lobbied hard for it. At the time, Blair, who was married to actor Gene Kelly, had been blacklisted due to her Marxist and communist sympathies. It was only through the lobbying of Kelly, who used his major star status and connections at MGM to pressure United Artists, that Blair got the role. Reportedly, Kelly threatened to pull out of the film It's Always Fair Weather if Blair did not get the role of Clara. Mann shot the film in sixteen days plus an additional three days for retakes. With an April 11, 1955, premiere (followed by a wide release July 15), the film received overwhelmingly positive reviews from critics. Ronald Holloway of Variety wrote, "If Marty is an example of the type of material that can be gleaned, then studio story editors better spend more time at home looking at television." Time described the film as "wonderful". Louella Parsons enjoyed the film, although she felt that it would not likely be nominated for Oscars. At a budget of $343,000, the film generated revenues of $3,000,000 in the US alone, making it a box office success. In 1994, Marty was deemed "culturally, historically, or aesthetically significant" by the Library of Congress and selected for preservation in the National Film Registry. The film's plot was remade in the 1991 comedy film Only the Lonely. The television film Queen of the Stardust Ballroom (1975) has been reviewed as a "gender reversal" of Marty. On the TV quiz show Twenty One, the question "Which movie won the Academy Award for Best Picture for 1955?" was given to Herb Stempel. He was pressed to answer it incorrectly even though Marty was one of his favorite films. This milestone moment from the 1950s quiz show scandals was dramatized in the film Quiz Show (1994). The animated series Rocko's Modern Life featured a parody of the character Marty, and modeled partially on his physical likeness, in the Season 1 episode "Rocko's Happy Sack". Another animated series, Hey Arnold! featured a butcher named Marty Green who was also based on Borgnine's character. Comedian and Curb Your Enthusiasm star Jeff Garlin is a fan of Marty, and his 2006 film, I Want Someone to Eat Cheese With, contains numerous references, including a subplot involving a studio remake starring singer Aaron Carter as the title character and actress Gina Gershon as Marty's mother. 1 2 HOLLYWOOD DOSSIER: 'MARTY' HITS JACKPOT – TEAM – ON THE SET By OSCAR GODBOUTHOLLYWOOD.. New York Times (1923–Current file) [New York, N.Y] 11 Sep 1955: X7. ↑ Chayefsky, Paddy. "Two Choices of Material". Television Plays, Simon & Schuster, 1955. ↑ Hirschhorn, Clive (1984). Gene Kelly – a Biography. London: W.H. Allen. ISBN 0-491-03182-3. ↑ Blair, Betsy (2004). The Memory of All That. London: Elliott & Thompson. ISBN 1-904027-30-X. ↑ "Delbert Mann". Rome News-Tribune. 13 November 2007. Retrieved 30 April 2016. ↑ Review by Ronald Holloway, Variety, March 23, 1955. ↑ "The New Pictures", Time, April 18, 1955. ↑ Mann, Delbert. Looking Back, at Live Television and Other Matters. Directors Guild of America, 1998. ↑ "Marty (1955) – Box office / business". Internet Movie Database. Retrieved July 11, 2011. ↑ "NY Times: Marty". NY Times. Retrieved 2008-12-21. ↑ "Festival de Cannes: Marty". festival-cannes.com. Retrieved 2009-02-01. ↑ "queenofthestardustballroom". sover.net. Retrieved 20 April 2016. ↑ "Hey Arnold! (TV Series 1996–2004)". IMDb. Retrieved 20 April 2016. Wikimedia Commons has media related to Marty (film).